All images are direct from camera - no computer manipulations. 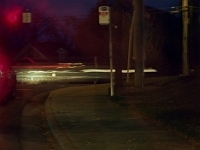 Exposures are up to 1 second. Lines created by moving camera. Subjects are automobile head lights, tail lights, stop lights, all things that make light.